Ithaca, New York, is commonly referred to by locals as "10 square miles surrounded by reality." 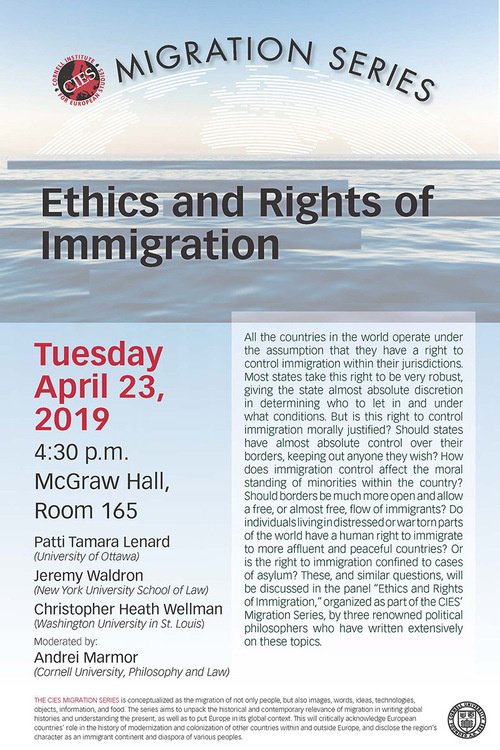 Consequently, an integral aspect of the mission of the Cornell Institute for European Studies (CIES) is to bring European and global issues to Cornell's campus, and to provide a venue for reflection, contemplation, and debate regarding these challenging topics. However, on occasion, an issue arises that is highly relevant both to Europe as well as the broader Cornell and Ithaca communities. The global refugee crisis is one such issue that has touched Europeans and Ithacans alike, and the transnational nature of this ongoing global challenge was on display during a roundtable discussion hosted by CIES entitled "The Refugee Challenge in Europe and the US," which took place in Physical Sciences 401 the afternoon of Thursday, September 8. The roundtable featured four experts on the subject: Stephen Yale-Loehr (Law School), Gail Holst-Warhaft (European Studies-Mediterranean Initiative), Sidney Tarrow (Government; Law School), Walaa Maharem-Horan (Ithaca Welcomes Refugees), and was moderated by CIES director Christopher Way. Yale-Loehr's presentation primarily addressed the refugee context within the context of the US, Holst-Warhaft contributed a discussion of the crisis in Greece, Tarrow addressed a more pan-European perspective in his remarks, while Maharem-Horan addressed how the local Ithaca community has responded to the refugee crisis and the efforts of an organization that she helps to lead, Ithaca Welcomes Refugees. According to Yale-Loehr, there are currently more than 60 million people living as refugees around the globe, the most since the end of World War II. In order for a refugee to receive asylum in the United States, he or she must demonstrate a "well-founded fear of persecution" to the courts, which has become a difficult standard to achieve for many asylum seekers. The situation in Europe is similarly difficult for refugees as it is for those in the Americas. Tarrow noted that Europe's refugee crisis comes on the heels of a continent-wide sovereign debt crisis. One result of this timing is that national responses to the refugee have varied quite significantly, leading to conflict within the European Union in deciding how to move forward. Nowhere are these challenges more under the microscope than in Greece, where Holst-Warhaft said that the government is having a very difficult time dealing with the high number of refugees entering Greece after completing a perilous journey across the Mediterranean. Some refugees in Greece have even adopted Athens' old airport as a temporary home, where their legal status within Greece remains in limbo. On a more uplifting note, Maharem-Horan detailed the efforts that Ithaca Welcomes Refugees (IWR) is making to help resettle refugees from across the globe into the local Ithaca community. Thanks in large part to the determined efforts of IWR, Ithaca is one of just 50 cities across the US to receive the official designation of a city of asylum. However, that designation can be stripped by the government, so IWR is constantly working to insure that refugees relocating to Ithaca have all of the resources that they need and to keep up with the required reporting guidelines. Although Ithaca is doing its best to contribute, Yale-Loehr argues that the US as a country needs to do more, and in particular to admit more refugees. "We need to stop blaming refugees for economic and social issues in their home countries," said Yale-Loehr, and "provide them with further assistance while they are in transit, adequately fund refugee assistance, and reaffirm that asylum is a human right." According to Maharem-Horan, identifying appropriate housing is the most difficult issue that IWR, as are finding volunteers with the requisite language skills to help facilitate the transition process. Those interested in donating to or volunteering for IWR should consult their website, http://ithacawelcomesrefugees.org/, for further details. Although Ithaca is doing its best to contribute, according to Yale-Loehr the US should be doing more, and in particular should admit more refugees than it currently is admitting. "We need to stop blaming refugees for economic and social issues in their home countries," said Yale-Loehr, and "help refugees and asylum seekers in transit, adequately fund refugee assistance, and reaffirm that asylum is a human right."